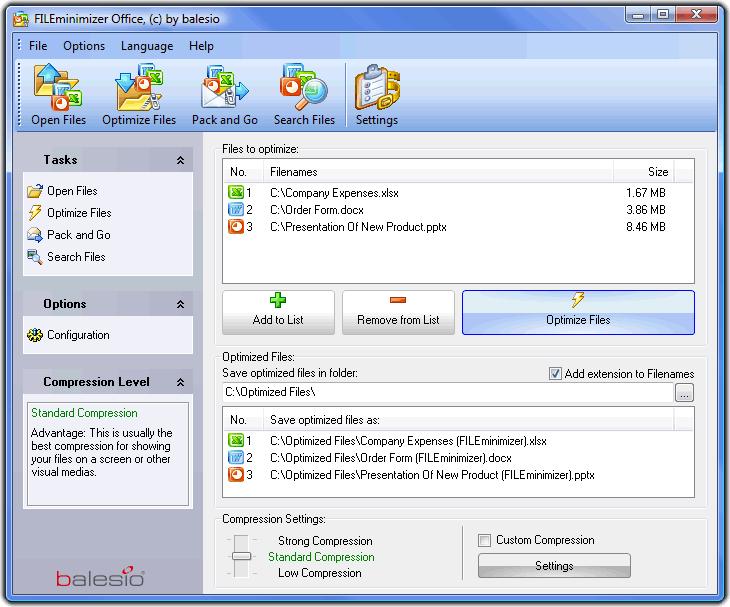 FILEminimizer Office helps to compress PowerPoint, Word, Excel files. 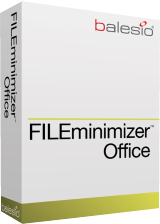 FILEminimizer Office 7.0 was available as a giveaway on February 15, 2018! 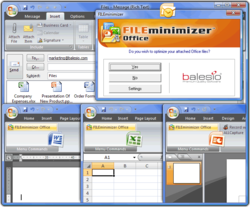 FILEminimizer Office will help you to compress PowerPoint, Word and Excel files, and to reduce the file size by up to 98% using an intelligent office file compression software technique, which compresses pictures and objects preserving the original file format and quality. 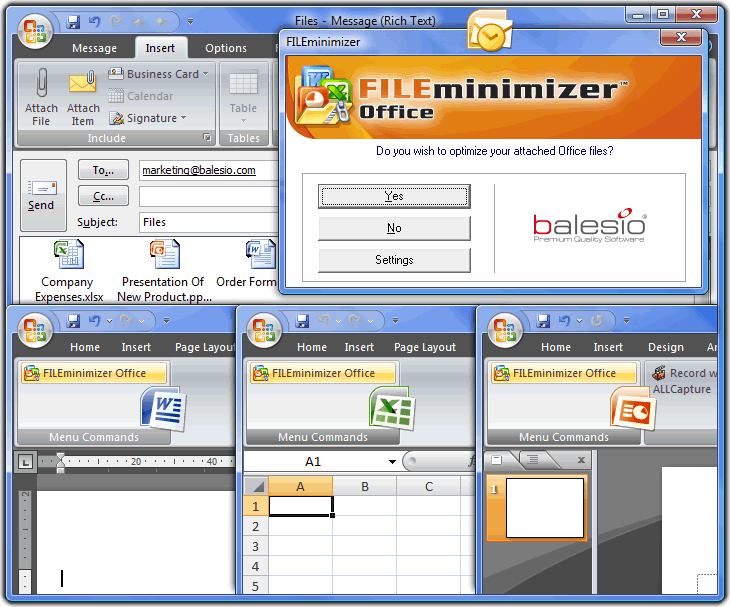 The optimized office files are then much smaller, safer and ideal for sharing and sending via email. Recipients don't need the software to edit or view the optimized files. Mailboxes, servers and networks are relieved and loading time is accelerated. If you would like to optimize PDF & Picture files as well as MS Office files, then Upgrade to FILEminimizer Suite 8.0 60% OFF! 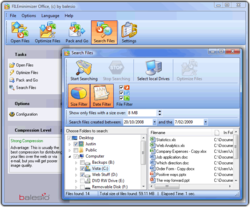 How would you improve FILEminimizer Office 7.0? When does the license expire? I can't find the terms of the offer. The program and license installed easily. When does the license expire? I can't find the terms of the offer. The program and license installed easily. >Upgrade to FILEminimizer Suite 8.0 60% OFF! How? - shows 50% off. >Upgrade to FILEminimizer Suite 8.0 60% OFF! How? - shows 50% off. This does what it says and interfaces well with office (inserting a tab in these programmes for easy access). It minimized a PPT presentation (lots of pictures) from 12.4 to 6.7 M with no obvious loss of quality on screen. It will not touch movies, so a PPT file with 5 embedded movies only went from 67 M to 55 M.
There seems to be less need for this type of program though. 10 years ago emailing 50 M files was almost impossible, large PPTs would strain old computers. Nowdays with dropbox and modern computers, usb sticks etc does it really matter if the file is 12 M rather than 5 M? This does what it says and interfaces well with office (inserting a tab in these programmes for easy access). It minimized a PPT presentation (lots of pictures) from 12.4 to 6.7 M with no obvious loss of quality on screen. It will not touch movies, so a PPT file with 5 embedded movies only went from 67 M to 55 M. There seems to be less need for this type of program though. 10 years ago emailing 50 M files was almost impossible, large PPTs would strain old computers. Nowdays with dropbox and modern computers, usb sticks etc does it really matter if the file is 12 M rather than 5 M? This product has already been offered in here in October 2013!!! Mario, I think you meant February 16, 2016, as per this page: https://www.giveawayoftheday.com/category/publisher/balesio/. TK and Suze, you're both right. I read the whole note which contains the license, and it was a Glarysoft giveaway!! Anyway, an old old version. This is weird. Well, you might have multiple PDF print drivers on your system - a PD|F reader (Adobe, Foxit...) and MS Office (2010 and late). Try all of them, perhaps at least one will perform better. AnAceBuyer, well if you use full sized 12 to 60 megapixel digital photos and do not pre-resize them to the maximum powerpoint resolution you know they will be rendered at then any documenet you produce with thiose unnecessarily print quality photos embedded is going to get unwieldy... it is the professionals job to ensure the correct resolution and image format is used prior to creating a word/excel/powerpoint or even a webpage to optimize both apearance in forseeable display environment and conserve transmission bandwidth and storage space and not giving away potentially expensive high resolution artwork that could be re-used inappropriatly by the recipiant. This may help with doing some of that work for you but nothing beats intelegent design of a document rather than algorithmic post-processing.